Students determine the coefficient of friction of a block of wood using three different methods: dragging the block with a force meter, sliding a block down an incline, and pulling a block across a horizontal surface. In each method, the free-body diagram helps students identify the forces acting upon the block and leads them into investigating frictional force effects on an accelerating object. The lab is ideal for AP I and II courses, IB courses, and advanced physics courses. 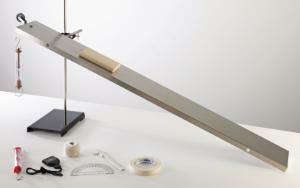 Ordering information: The kit includes a friction block with a hook, 20 N and 10 N spring scales, inclined plane with pulley, stopwatch, tape, string, and protractor. A triple beam balance and masses are required but not included.